The Gowanus Lounge: BAM Cultural District Moving Forward? 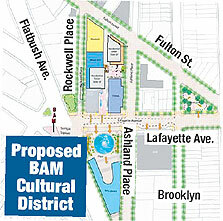 BAM Cultural District Moving Forward? 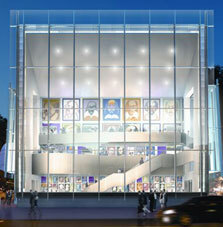 * The Theater for a New Audience, to be built early next year. The 299-seat theater is modeled after London's Royal National Theater. * A dance studio in a 20-story residential tower with 150 apartments, half of which will be affordable housing. * The Visual and Performing Arts Library, currently on hold until a new executive director is named for the Brooklyn Public Library. * A public plaza, which will be built with an underground parking garage by landscape architect Ken Smith, who designed the outdoor space at the new 7 World Trade Center building. A request for bids on the project goes out next month. Great blog. I was wondering if you know how tall the new library will stand. I'm thinking about purchasing in the new condos in the Savings Bank (One Hanson Pl), but don't want to purchase a unit that will be obstructed. Any insight?